Japan's aggressive politics in the 1940s was a popular target of Will B. Johnstone. 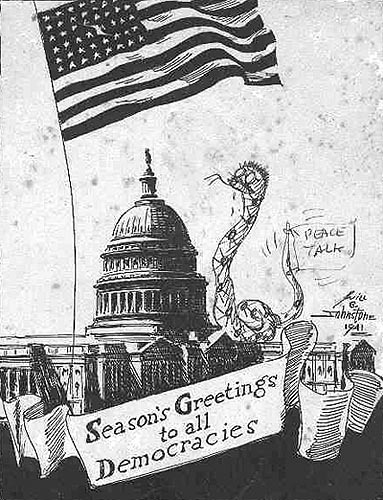 The depiction of the Japanese as "Tojo", with a snake body and - occassionally - a "peace talk" flag tied to his tail, was a classic. A news item inspired this cartoon; "Japs dedicate new song to memory of late Admiral Yamamoto to remind people of determination to crush Anglo-americans". "Tojo", Hitler, Mussolini and French traitor Pierre Laval all get their share in these lyrics ("Tin Pan Alley, please write! ", Johnstone has added), but also his own character "the Taxpayer".